THE STORY - Queen of France at 16 and widowed at 18, Mary Stuart defies pressure to remarry. Instead, she returns to her native Scotland to reclaim her rightful throne. But Scotland and England fall under the rule of the compelling Elizabeth I. Each young Queen beholds her sister in fear and fascination. Rivals in power and in love, and female regents in a masculine world, the two must decide how to play the game of marriage versus independence. THE GOOD - Stunning, epic direction from Josie Rourke and strong performances from Saoirse Ronan and Margot Robbie. THE BAD - Tries to fit so much of a large narrative in that it can become overburdened and muddled story wise. ​​After eschewing the early fall festivals in favor of a late, AFI Fest premiere, many feared that "Mary Queen Of Scots" was bound to be a dud. Fortunately, those concerns were ill-founded, as Josie Rourke’s directorial debut tramples expectations, brandishing two fiery performances, grand swashbuckling direction, and a twisty political script. 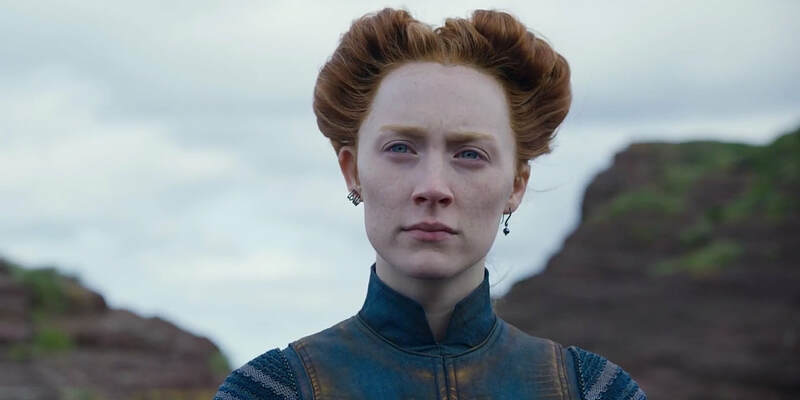 The film charts the rise and fall of Scotland’s 16th-century queen, Queen Mary Stuart (Saoirse Ronan), as she repeatedly outmaneuvers and outsmarts the men and her path until tragedy becomes unavoidable. One knows how the story ends from early on. Why? Because you probably know your history and the film lets us know from the first scene that Mary Stuart will lose her head to her cousin Queen Elizabeth I (Margot Robbie). That doesn’t mean the journey isn’t engaging. Well-experienced in the theater world, Josie Rourke uses her theatrical background to her advantage rather than to her detriment. Rather than feeling stagey, the images on screen crackle with dynamism. Her blocking is creative, allowing for clearly-communicated visual symbolism. When frames linger, they lend an aura of rich baroque paintings, and when they move, her frequent dollies and quick cutting lend the proceedings an indicia of "Game Of Thrones." In fact, if nothing else, the film serves as a clear calling card for Rourke to helm some of the series’ coming spinoffs. Indeed, it is Rourke’s natural eye for visuals and movement that ultimately proves to be the film’s greatest strength. One would assume that Rourke was a director who had long worked with the big screen. Paired with Oscar-nominated Cinematographer John Mathieson ("Gladiator"), the film conjures up some of the year’s most striking images. It’s a feast for the eyes, capturing snowy landscapes, claustrophobic interiors, and wide Scottish highlands. Rourke may have cut her teeth on the stage but she was born for the screen. "House Of Cards" creator Beau Willimon pens a twisty, engaging script. Occasionally, the film’s desire to fit so many events into a two-hour narrative prove a hindrance. The script maintains Willamon’s knack for twists and surprising power plays, but occasionally events feel rushed and/or muddled. And admittedly, although his dialogue is often crisp, it can occasionally feel on the nose. His bombardment of events and plot developments are furthered muddled by Chris Dickens’ editing, which cleverly highlights the similarities between Queen Mary and Queen Elizabeth, but also occasionally loses the narrative and lends itself to inconsistent pacing. Fortunately, Rourke’s direction is there to pick up the slack along with excellent performances from the two central leads. Ronan and Robbie light up the screen, each landing their fair share of Oscar-friendly moments. Robbie arguably delivers her strongest performance yet and boasts the flashier of the two roles, buried beneath layers of prosthetic makeup, but Ronan is also strong. Neither bungles their accents, and both land their “big” scenes. Both are sympathetic characters, caught between the enormous obstacles of being surrounded by men in an incredibly misogynistic world. Yes, the film may play fast and loose with its history in highlighting the connection between the two queens, but that doesn’t make it any less engaging or emotional. Again, even knowing where the journey will take you, the film proves engaging, and at times, even heartbreaking. Seeing just how unfairly the men inhabiting the film’s world stacked the decks against the two queens, and how hard those queens, in turn, worked to overcome obstacle after obstacle, only to face yet another is infuriating, not to mention stressful to witness. Which is precisely the film’s goal. Like another “based on a true story” film this year ("First Man"), "Mary Queen Of Scots" faces a few flaws in its screenplay, but more than overcomes them with stunning direction, visuals, and performances. Nearly every element of the film’s technical craftsmanship works. Special mentions go out to the period-accurate costume and production design. It also gets special props for seamlessly including people of color in a genre that has typically ignored them. "Mary Queen Of Scots" is dark, long, and exhausting. Yet it’s also exuberant. And it’s angry. It is a love letter to the forgotten women of history, the rulers, the queens, who smashed obstacles and refused to yield. It is a tragedy and yet also a rousing crowd pleasure. Is it flawed? Sure. There’s enough material to make a season of TV, and fitting all of that into two hours must have been hard. But it’s just so well-directed and compelling. History may not have given Mary Stuart the dignity she deserved, but Josie Rourke’s film certainly does.